"For people like me, who can't make good pancakes, this recipe is perfect. Everything is cooked in the oven in one single skillet, giving the plus of easy clean up. Serve with maple syrup." Place the eggs, milk, vanilla extract, sugar, salt, and flour into a blender. Pulse until no dry lumps remain in the batter. Melt the butter in an 8-inch, cast iron skillet over medium-high heat. 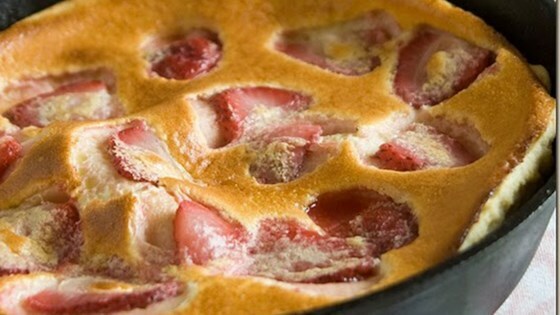 Pour in the batter, and drop in the strawberries. Place the skillet into the oven, and bake until puffed and golden, 20 to 25 minutes. Remove from the oven and serve immediately. Cinnamon: add 1/2 teaspoon of cinnamon to the batter. Skip strawberries. Apple: slice 1/2 an apple and cook it on the melted butter until lightly golden. You may add a pinch of cinnamon to it. Skip strawberries. Blueberry: use 1/2 cup of blueberries instead of strawberries. Banana: add 1 sliced banana to the melted butter and cook it until golden, but still firm. You may add a pinch of cinnamon to it. Skip strawberries. Chocolate chip: add 1/2 cup of your favorite chocolate chip to the batter in the skillet. Skip strawberries. Chocolate: add 1 tablespoon of cocoa to the batter. Plain: skip strawberries and top baked pancake with a squeeze of lemon juice and powdered sugar. I followed this to a "T" but once it was cooked it was as heavy a a brick. Too many eggs. Awesome recipe! I have made many of the variations and they have turned out great too. I will say that I like this recipe best with just two eggs. Thanks for sharing! I love the banana version of this. My husband likes the apple version. I have not tried the other versions yet. Deffinately a keeper! Varied recipe using frozen blueberrys and 2 eggs, was very nice but will try's savory version tomorrow using grated cheddar and 2 eggs with no sugar. Very easy recipe but also very flexible.